The OSU Summer Veterinary Experience is a hands-on learning experience for academically talented high school students interested in veterinary medicine. 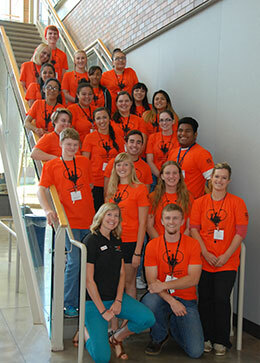 The upcoming Summer Veterinary Experience will take place August 4-9, 2019 on the Oregon State University campus in Corvallis, Oregon. The cost of the program is $750. Full scholarships, including housing and meals, will be available for selected students who meet established criteria including, but not limited to: 1) come from a low income family, 2) be a first generation college student, or 3) have an ethnic or cultural background that is underrepresented in the veterinary profession. The program takes place in a university environment and includes both social and educational activities. College faculty, graduate students, and veterinary students will serve as mentors and instructors for the participants. The students will have the opportunity to participate in research projects, as well as clinical activities in the veterinary teaching hospital and in off-campus settings. Popular sessions from previous years include learning how to do a physical exam with live dogs, surgical skills lab, and demonstrations of the equine treadmill and the underwater treadmill in small animal rehabilitation. Mentors and instructors will work with each student to discover and explore her/his talents and understanding of the basic sciences, animal and human health, and social sciences. Special attention will be devoted to development of interpersonal and leadership skills, by engagement in learning projects, discussions and public speaking opportunities. Throughout the experience, staff will provide a supportive atmosphere, with emphasis on teamwork and open discussion. The participants will also receive guidance on preparing for college and the financial aid process. (5) have demonstrated maturity, initiative and curiosity about the world in general. Applications for the 2019 Summer Veterinary Experience are now open. Please use the following link to access the application: Summer Veterinary Experience Application. The application will close April 15, 2019 and decisions will be made in early May. Decisions will be communicated via email. The college is fully accredited by the American Veterinary Medical Association, Council on Education (COE).